In 1954, editor Alan Ross introduced a new incarnation of The London Magazine. To mark the re-launch of the Magazine, T.S Eliot wrote “A Message”, published in Volume 1 Issue 1 in February 1954. The article, addressed, “…primarily to those English readers, at home and overseas, who profess to take an interest in literature,” captures something of the enduring spirit and purpose of the Magazine, and it is reproduced in full below. A message of good will, from an elderly man of letters, on the appearance of a new literary periodical, may easily be regarded as a mere act of courtesy towards a venture in which he bears no responsibility. In order, therefore, to make it evident that this is something more than a perfunctory gesture of benediction, I wish to produce my credentials and explain why I am interested in the success of The London Magazine. In the first place, I am interested because I myself edited a Literary Review for seventeen years. 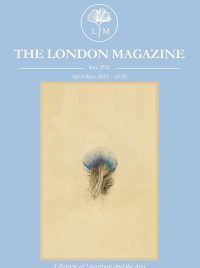 I am far from wishing the The London Magazine should be cut on the pattern of The Criterion: for one thing, it must be shaped according to very different conditions; and, equally important, it must be shaped according to the mind of the editor. But my own years of editorship have given me some understanding of the essential functions of a Literary Review at any time, as well as some experience of the difficulties which it has always to confront. And that experience, in spite of and because of my own mistakes, should qualify me, to some degree, to appraise the editorial direction of a new periodical of the same kind. I am confident that the Editor and Board of The London Magazine will produce a periodical in which I shall continue to be interested. My belief in the value of Literary Reviews has not waned: indeed, it has only been strengthened by awareness of the vacuum of the recent post-war years. It is undoubtedly a scandal, that we have had, in London, since the end of the War, no literary magazines to compare with those which have sprung up in other countries. There are half a dozen, on the Continent, for which we have no equivalent. As for America, I am aware of a common Anglo-American danger of abandoning the central position for those of two extremes: the Academic and the Popular Educational. The type of magazine from the lack of which we suffer is nether that which provides a vehicle for the expression for critics occupying university posts nor that which endeavours to elevate the Public Taste. What we need is a magazine which will boldly assume the existence of a public interested in serious literature, and eager to be kept in touch with currant literature and with criticism of that literature by the most exacting standards. But will that public give its support? In England, there are far too many people, professing to be lovers of literature, who are ready to say either “this magazine lacks support, and therefore there is no point in my supporting it,” or else “this magazine is substantially backed, and therefore can do without my support”. Too many of those people who ought to subscribe to a literary magazine say, “I haven’t the time to read it regularly, but I shall buy a copy when there is something I ought to read”. Such people most frequently overlook the number containing something they ought to have read. They say then that they are sorry they missed it. During seventeen years, I knew which lovers of literature, amongst those who could afford to pay the subscription, were subscribers, and which were not. The first function of a literary magazine, surely, is to introduce the work of new or little known writers of talent. The second is to provide critical valuation of the work of living authors, both famous and unknown. The third is to be in the best sense international. The magazine must be aware of what is happening in other countries and of what is being written in other languages; and must keep its readers informed of what is happening – but never, I would say emphatically, merely in the way of “news” or gossip. The readers must be encouraged to read books, not merely to talk about books they have not read. But the most important aspect of any literary magazine is that it should be read by, and should command the respect of, the editors and collaborators of similar magazines in other countries. And the new writers, whose work it introduces, should be writers who deserve the attention of writers and of readers of literary magazines in other countries. I am addressing myself, primarily, to those English readers, at home and overseas, who profess to take an interest in literature. It is their duty to take out a subscription to The London Magazine. Without literary magazines the vitality of the world of contemporary letters is gravely reduced. If our society cannot provide for such a magazine, a circulation large enough to justify its existence – and a subscription, it must be remembered, is not merely an act of financial support but a declaration of moral support – then the outlook for our civilization is all the more sombre.